375 Gallon Saltwater system that includes: 375 Gallon Acrylic Aquarium with black back “L Shape” the main panel is (72 1/4″”x24 1/4″x36 1/4″) & the other is (24″x24 1/4″x36 1/4″) With 2-overflow boxs, 1-36″ & 1-48″ Current LED Pro Strip Lights, Current Single Ramp Timer, Ocean Clear Filter with cart, Nu-Clear Bio Filter, Rainbow 40 Watt UV Sterilizer (New Bulb), 10 month old 1/3 HP Current Chiller, 2-PCX40 Pump, Tetra Air Pump & Tubing, Rio 2100 powerhead, Acrylic lids, 200 LBS Lace Rock, & Plumbing Parts! It came out of a wall so will need a stand or build into wall. (DOES NOT INCLUDE WATER OR FISH) Tank has been taken down. 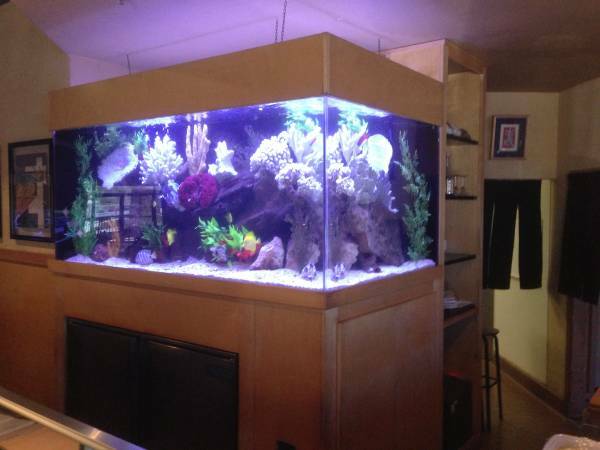 For an extra fee tank can be moved and installed at you home or office!